Every week a different FADER staff member will pick a clothing item or accessory that he or she has lately been spending a lot of time with—or would like to—and write a little love letter to it. We would’ve done a column on who we’re dating but that seemed a little bit much. 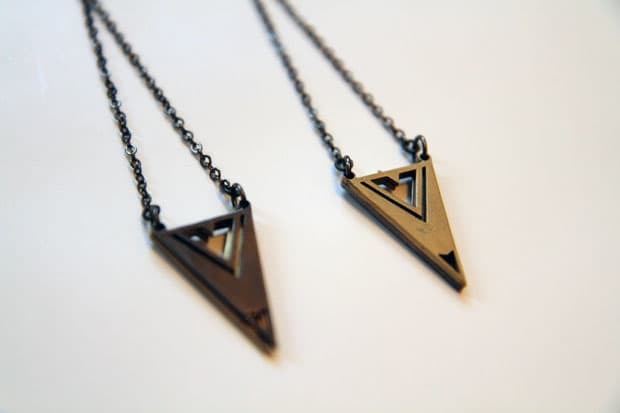 This week Kori Dyer talks about her new Hoisted Triangle Earrings, made by Chris Habana. A few nights ago, I found myself mingling in Chris Habana's Alphabet City walk-up. Dressed in head-to-toe denim, skeleton stockings inching up his thighs, he told me about his San Fran raver-influenced self-titled collection that debuted in 2004. An amazing host, Chris was serving up rosé spritzers as we browsed his angular and dynamic designs. He encouraged us to sharpie his illustrious personal wall of autographs, graffiti and clippings from vintage fashion magazines. Not just a great party host, Habana had some amazing jewelry to show off as well. As I stepped into his world of gothic iconography, the first piece that caught my eye was the exquisitely die-cut geometrical Hoisted Triangle Drop Earring. Hand-crafted in his studio apartment (like all of Habana's work), the bold yet flirty arrowhead tips of this spirtually-inspired earrings fall from the lobe to just above the shoulder. With every wear, they take me back to Habana's awesome world—a daily, dangling reminder of a creative soul.